This one's qualifying as an Awesome Turtle Picture because 1) I like it, and 2) it was a cool surprise for me. I love how Michelangelo all on his lonesome is inexplicably wearing the "Space Cadet" outfit from the classic Playmates TMNT toyline. Though wasn't it Raph who had the Space Cadet toy? Aw, I don't know. I never owned the variants, back then. And if you're wondering about the crease in the middle, the piece was originally done in a sketchbook (no, my buddy didn't fold the print in half like some sort of barbarian). There was only a 'Space Cadet' version of Raph, producer in 1990. In 1994, however, all Turtles received astronaut variants to commemorate the 25th anniversary of moon landing. They had very different designs, though, and were identical to each other (apart form their colours). 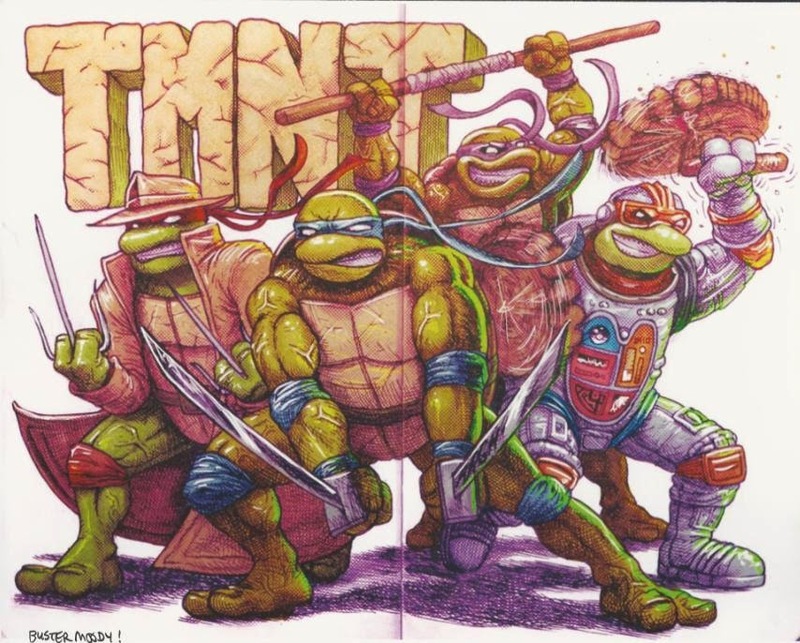 Also notable that it's Raph who's wearing a trenchcoat in the drawing, as the same variant series that spawned Raphael the Space Cadet also had Don the Undercover Turtle. Later on, there were also variants of all four Turtles in fabric trenchcoats (originally dubbed 'The Undercover Turtles). Then again, all Turtles wore trenchcoats and astronaut outfits in various media, so screw it. Hideously looking new designs. It's like the 'New Mutation' designs, but with hunchbacks. Maybe the folks at IDW can make them look decent if there's going to be a comic book adaptation.